Cillit Bang has launched a pioneering kitchen dispenser, the only product on the market to deliver sparkling dishes and gleaming surfaces in just one system. What better way to review this than to make a really messy recipe or two and test it! I was provided with some recipes from Great British Bake Off runner up Holly Bell! 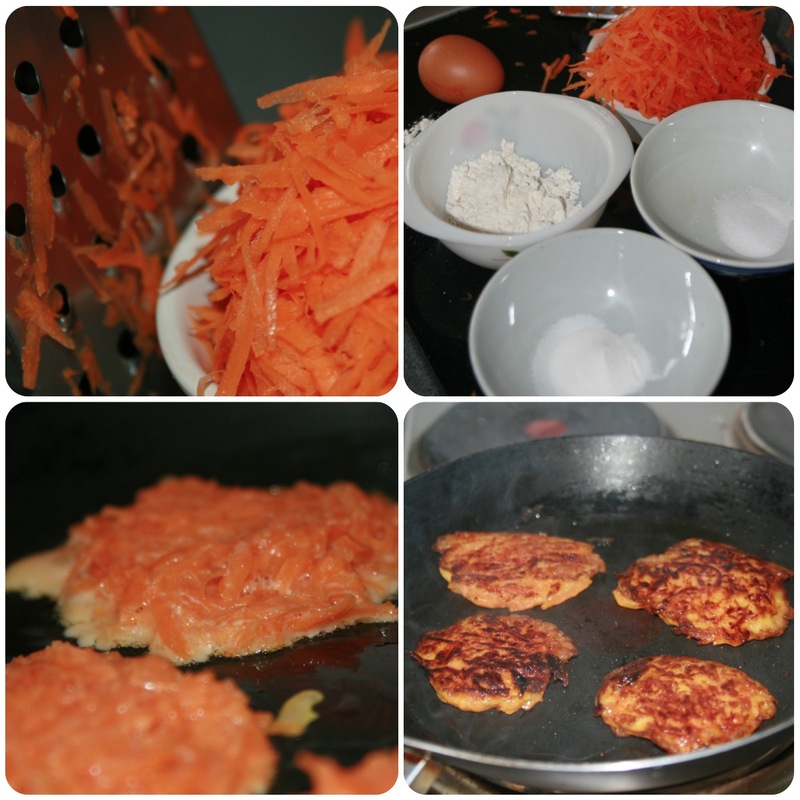 Carrot Fritters sounded healthy (ish) and my kids love carrot! Sometimes it is difficult to find a new and interesting way to cook them, so I got together the ingredients (3 grated carrots, 1 egg, 1/2 teasp of baking powder, 2 tsbsp plain flour and Oil – not olive – for frying) and set about making them. 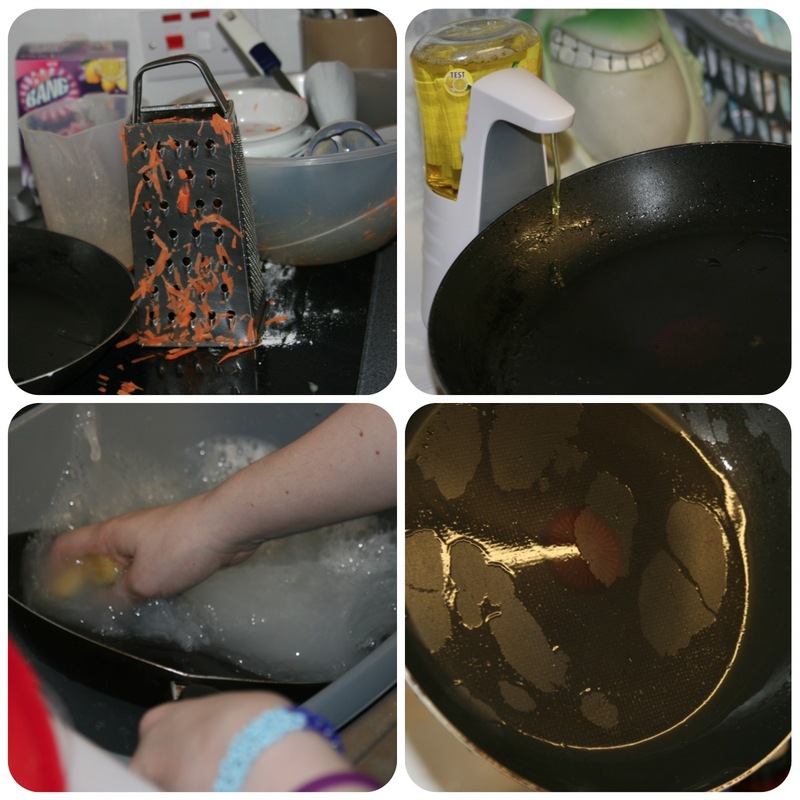 Well there was a mess, carrot everywhere and lots of pots to wash including a dirty, greasy frying pan to boot! A great start to test the Cillit Bang All in 1. You switch on the dispenser using the little power button on the back. I passed the Frying pan under it and out came the Cillt Bang smelling of lemons, a no touch dispense – FAB, especially considering you may already have wet hands from washing up! I gave the pan a quick wipe around with the sponge and put in some warm water to complete the wash and it came up sparkling and not greasy at all! I was (and still am) impressed! Well after these delicious Fritters, it was time for some pudding!! Well I couldn’t resist giving the Cornish Fairing Ginger Biscuits a go. 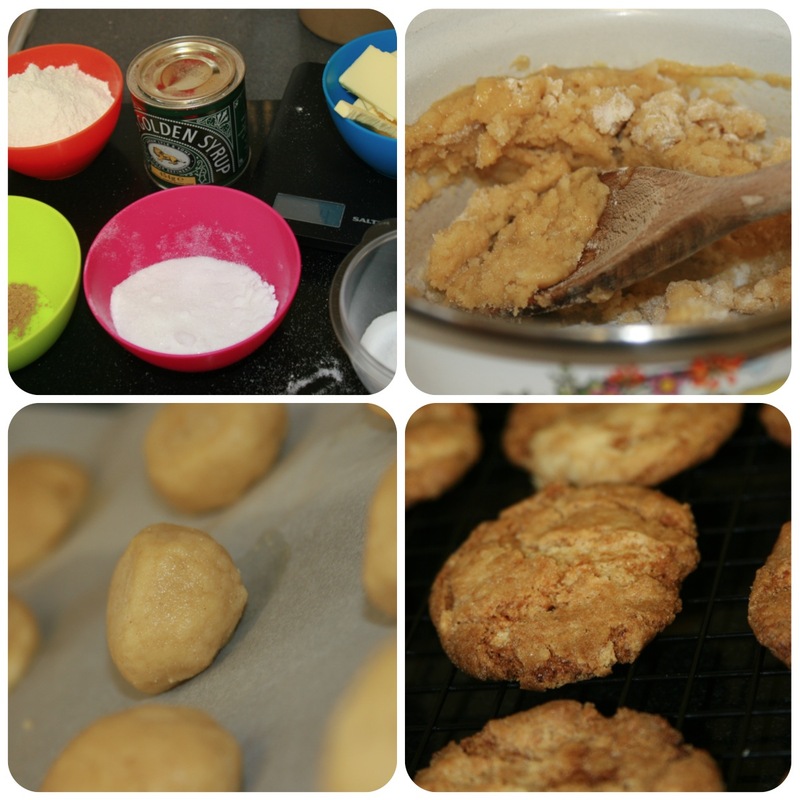 Time for more ingredients (4oz Butter, 6oz Self Raising Flour, 3oz Caster Sugar, 1 level tbsp golden syrup, 1 level tsp bicarbonate of soda), an easy recipe, but definitely another messy one! The worst thing was the state my kitchen side was left in! Flour everywhere (the bags never tip right, it even went on the scales too!). So I got the Cillit Bang out again and set about my side! As I was wiping a side down this time, I held a sponge under the nozzle and out came a squirt of the lemony freshness. I then directly used it and wiped down my side, rinsed the sponge and another quick wipe and my worktop was sparkling, really sparkling!! It was so easy, picked up the flour, cut through the stickiness. It was great, there was no work to it at all, squirt, wipe, rinse and it is clean – what could be simpler! I have to say I have fallen in love with this Cillint Bang All in one! 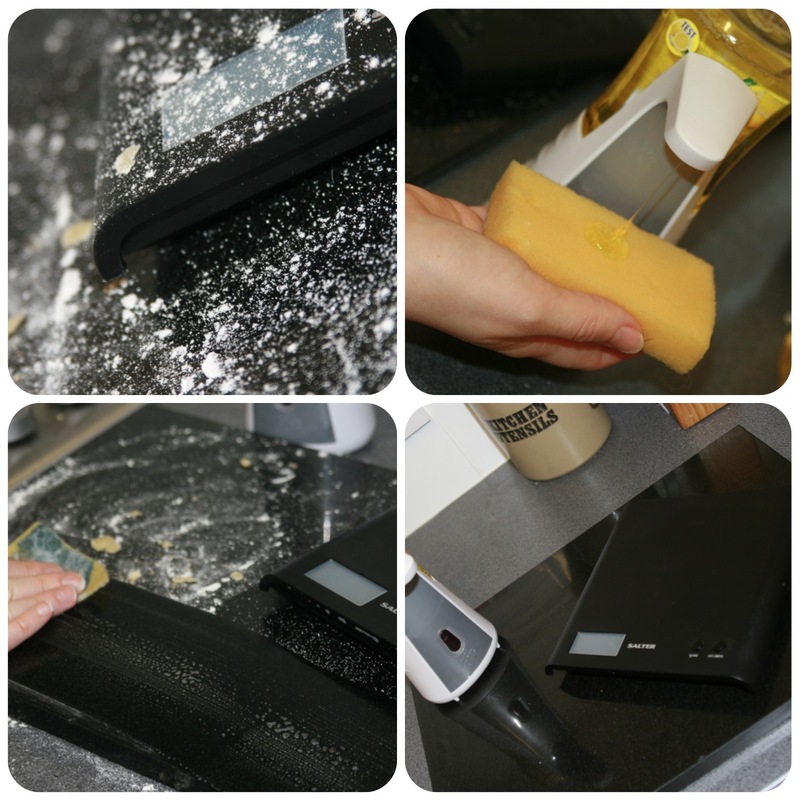 So easy to use, it’s no touch dispensing system, the fact it is suitable for pots and surfaces, the lovely clean smell and the performance! So much to love, it now sits patiently next to my kitchen sink waiting to be used! The only thing is I have forgotten to switch it off and then moved it and it has dispensed on my hand, but my hands smell nice! A massive thumbs up (who thought I would ever say that about cleaning!). Now I am off to enjoy another Ginger Biscuit! I was supplied with the product and means to buy the ingredients for this review, however all views are my own and are honest!